We're impressed with the AMD A8-3850 Fusion APU, giving the equivalent Intel offering a kicking in both computational and especially graphical performance. The AMD A8-3850 Fusion APU is the current top-end desktop Llano chip, and is a bit of a doozy. Last month saw the launch of the first Llano Fusion chips from AMD on the notebook side, the AMD A8-3500M, and if that isn't enough alliteration for you we've now got the release of the desktop Llano APU code-named Lynx. Before we go any further we ought to get into what the hell we're talking about when we're going on about an APU. It's an Accelerated Processing Unit, essentially that means it's a combo chip combining both traditional CPU and GPU parts in one die. That's right, we're back to the old days of the one chip to rule them all, though this time we've actually got graphical prowess to shout about. 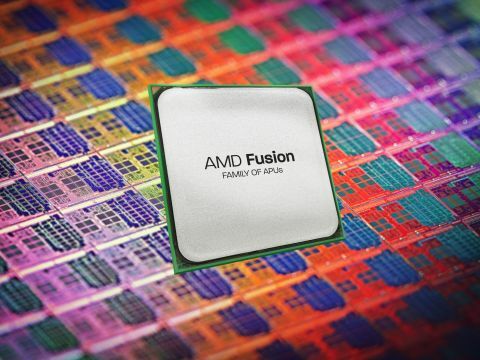 AMD has released Fusion APUs before now, with its lower-end Brazos chips (Zacate and Ontario) paving the way for this far more serious, performance part. Both Brazos chips though were designed specifically for the ultrathin notebook market, coming in at 9W for the Ontario chips and 18W for the Zacate APUs. They did make appearances in the mini-mobo segment of the desktop market but didn't really take off. Intel stole the march on AMD in terms of performance parts though with its Sandy Bridge lineup, integrating its HD 3000 and HD 2000 GPUs in with its 2nd Generation Core CPUs. Intel's focus though was on powerful CPU parts with an improved GPU component integrated into the chip. The Llano laptop we checked out last issue has us astounded by just how much graphical grunt AMD has managed to pack into its latest mobile APU, offering legitimate gaming performance out of a laptop that's capable of going for eight hours and costs around £600. On the desktop though it's looking even more impressive. The CPU component of the mobile part looked pretty weak at 1.5GHz, but on the desktop it's a far more serious setup, and for a far more reasonable price. Around £400 for a proper DirectX 11 gaming machine, with the top-end A8-3850 Fusion APU, capable of playable framerates on a 22-inch panel? Sign us up Mr. AMD.